Announcing...The Pebbles / AC Warehouse Sale! - Pebbles, Inc.
Announcing…The Pebbles / AC Warehouse Sale! 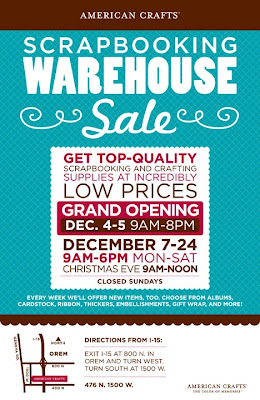 The American Crafts Warehouse Sale begins this Friday, and plenty of Pebbles product will be included! There will be tons of great overstocked, miscellaneous and discounted items — all at reduced prices. The sale starts Friday and runs through Christmas Eve, Saturdays included. Hope to see you there! Mmmmmmm ..think of all those Thickers !!! !